Pros: A tantalising storyline that drew me in for its final reveal. Cons: Relationships between the characters aren’t easy to read. A compelling drama with a good bit of mystery and a fantastic set. The Drayton Arms is fast becoming one of my favourite theatre venues in London. Occupying a delightful position on the Old Brompton Road (quieter and vastly less populated than its younger sister Brompton), the building sits regally on the corner of a junction where visitors can admire its façade of rose coloured brick and detailed architectural features as they approach. Both the pub and the theatre feel very local – the people who go there for a pint are incredibly Chelsea, as are the creatives who collaborate to put on shows upstairs, and I like this. It’s like visiting a public house in the centre of a village back in the time when the pub as opposed to Twitter was the source of all community news. 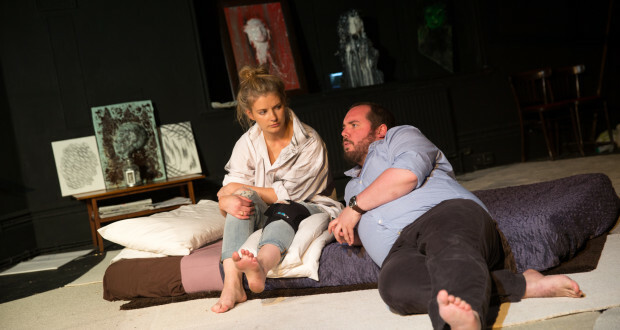 Face to Face is well suited to its West London surroundings, as all the action takes place in a flat occupied by young artist Rachel who is unmistakably Chelsea in her lifestyle and upbringing. Functioning as both apartment and art studio, Ellis Higgins’ set is impressive and fantastically naturalistic. 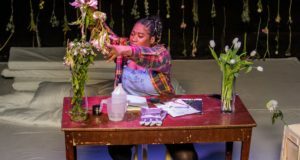 With the paraphernalia of a simple and isolated life thrown about chaotically, plus the tools of Rachel’s experimental art tossed across the floor, it resembles the ordered mess of a woman living alone. Everything melts into the theatre space wonderfully, so you really feel like a guest in a flat rather than an audience member. I was comfy in my seat too, as thankfully it was closer on the seating spectrum to sofa than hard back. The story is intriguing from the start. Rachel (Rebecca Bell) has a new client, Greg, and in order to create his portrait she interrogates him, pushes him and just generally exudes strangeness in support of her artistic method. 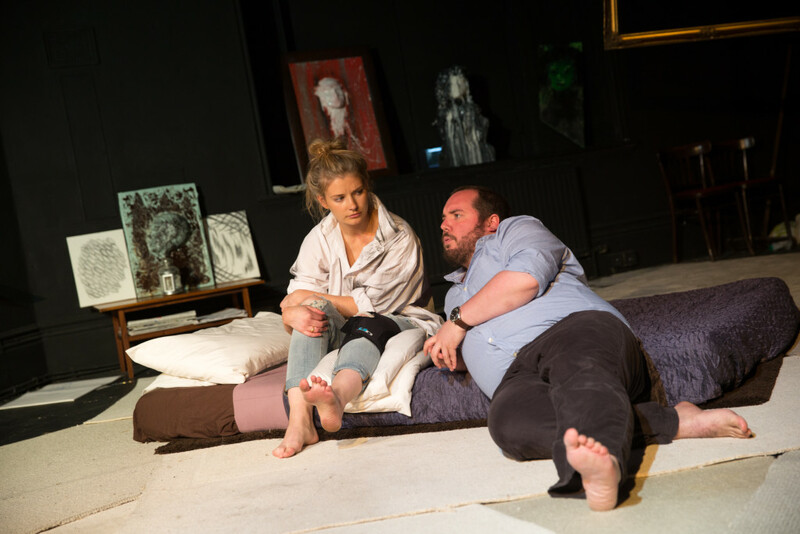 We quickly learn that Greg (Tom Telford) is not all he seems, and Rachel practices deception from the start to maintain her secluded hermetic life, never leaving the flat. Rachel’s sister Ajani (Lindsey Chaplin) makes several appearances through Skype calls, and the staging of this really pushes home the theme of isolation. Shaun (Joey Bartram), Ajani’s less than conservative boyfriend, is similarly isolated from the rest by his oddities and secretive behaviour. There is barely any sustained physical contact between the characters, which might be why they feel so detached from one another. The performances are strong, but I just couldn’t get a hold of the relationship dynamics, as the ties between the characters are too vaguely defined. 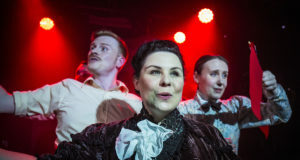 On the other hand, playwright Heather Jeffery may well have intended to cause disruption and a sense of unease, in pursuit of the mystery aspect of the plot. The plot drew me in: from the beginning I was keen to get to the bottom of the accident in Rachel’s past, so on this point the text is very compelling. Direction is similarly effective and Rachel’s scene changes are as natural as the set, carried out less as a change of scene than a flurry of activity in the artist’s day-to-day life. The scenes are well lit with a bit of darkness to add tension at all the right moments. I’d say the play sits confidently in the thriller genre, and this atmosphere could be built upon to make the piece even creepier. If this sounds like your cup of tea, then definitely make a trip to the gorgeous Drayton Arms Theatre before the run ends.